I recently had the pure delight of spending five days on a Continuum Movement retreat near Sydney with my dear friend and inspiring teacher Amber Gray, who, amongst many other skills and credentials, is the only Continuum teacher to regularly visit Australia and offer this rich practice. Continuum Movement was developed by Emilie Conrad, a US dancer who spent five years living and dancing in Haiti in the 1950s. It was during this time that Continuum Movement was birthed out of a deep curiosity and insight, into a rich practice of somatic inquiry. It is a practice that uses breath, sound, movement and an evolving philosophy of life to tap into and awaken the natural intelligence of the body and its fluid resonance. In my experience, it fosters an easeful practice of listening and a profound state of open, alive awareness that I have not encountered so deeply in any other practices or traditions. The title of this particular retreat was “At the Crossroads”, drawing on Amber’s experience in the vodou traditions and ceremonial practices of Haiti (out of which Continuum emerged). With our Continuum ‘dive’ structured according to the phases of Haitian ceremony, Amber wove the history of Haitian vodou and insights from the philosophy and tradition through the retreat. The crossroads is the place, the plane, the movement between birth and death, light and dark, love and fear – that, like the yin-yang of the Tao, ultimately reveals these polar opposites as one and the same, inseparable and interdependent. During the retreat, we were invited to bring our questions, our desires, our offerings and honourings to this crossroads and receive our own insights through the practice. When I talk about Continuum, I often find myself describing it only as ‘weird’ or ‘amazing’, at a loss for words as I am still trying to find ways to articulate what the practice is and why it is so powerful. The most ‘useful’ way I have discovered to describe it recently is a “moving sound meditation”. But even that does not do justice to the richness of the practice, which alternates particular patterns of breath, unusual sounds, and simple movements with “open attention” – where you rest into echoes of the patterns and follow the impulses and sensations that arise into spontaneous movement. In this space of open attention, you can experience profound physical unwinds, emotional releases, deep rest, trance states, or the experience of the body ‘being moved’ by some natural intelligence that is awakened. Or perhaps you are simply present and awake to the very ‘ordinary’ experience of being in your body and your everyday mind. One of the most potent lessons I have received through my practice of Continuum is that the ‘profound’ states and the ‘ordinary’ states are equal in value. They are all expressions of consciousness, of being, of life: consciousness doesn’t change, only the states of the mind change. And they are all equally precious, equally wonderful, equally ordinary, whatever they may be. Many traditions teach their students not to go chasing ‘spiritual’ experiences, as the very chase can lead you astray from the discovery of awakening into simple being. A key element of Continuum is an emphasis on what Emilie called being “self-referential” – which we might also think of as autonomy. Rather than simply doing what you’re told to do moment to moment, as in many traditions of discipline, you are taught the sound/movement sequence (the “dive”), and then you make your own way through it. In this way, your experience emerges through your own intelligence, wisdom and self-reliance: through listening. You become your own guide, your own teacher, and the master of your own experience. And I finally awakened to that simple realisation. In deep reverence and gratitude to Emilie Conrad, who passed away last year; to my dear friend and teacher Amber Gray; and to all of the Continuum teachers who are keeping this evolving, rich practice of discovery and life alive. In honour of the breath, your constant companion, your guide, your best friend. She is right there with you – if you listen, she will tell you so much about yourself, your emotions, your mind-states: she gets hot and fiery when you feel angry, calm and deep when you relax, light and fast when you are anxious, shallow and soft when you are in deep meditation… she is not afraid to follow you to all the places you go. The breath taps you deep into your nervous system and your emotional state, and it’s the only visceral function of the body that is both autonomic and can be voluntarily regulated. The breath is a constant, present tool to guide your focus and awareness into your body and into the now. Which is why the breath is such a powerful tool. 1. Take a comfortable seat either on the floor or in a chair, where you can sit easefully for about 10 minutes. Take a moment to notice how you feel in your body, your mind, your emotions. Allow your body to rest into your seat, but lengthen your spine and feel the crown of your head reaching gently towards the sky. Feel into the space in the upper body created by this lift of the spine. 2. Find your natural breath, very simply observing the breath as it moves into the body, and as it moves out of the body. Do not try to change the breath, do not make any effort, simply observe your in-breath and your out-breath, accepting your breath exactly as it is. You might also start to notice where the breath touches the inner space of your body. Do this for 1-2 minutes. 3. Invite the breath to gently deepen. Like a somanaut exploring inner space, invite your breath to explore the full inner space of your body. Where can the breath go? How does it feel as it moves into previously uncharted territory? 4. 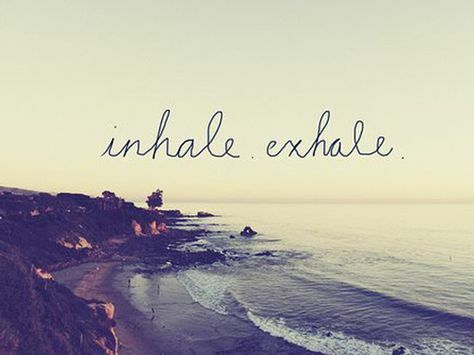 With your deepened breath, start to work with a count: inhale to a count of 4, exhale to a count of 4. Remember to keep the practice comfortable, make sure you are not straining or struggling with your breath. This is not about how long and deep you can make the breath, but finding an evenness between your inhalation and exhalation. This is called Sama Vritti Pranayama (equal ratio breath). Do this for 2-3 minutes. 5. Let go of the count and come back to your natural, effortless breath. Observe now the quality of your natural breath. Is it fast, slow, calm, ragged, even? Where does it touch inside the body? How do you feel in your body, your mind, your emotions? 6. Thank your breath, seal the practice any way you wish, and as you continue with your day – remember to touch base with your new friend from time to time to see how she’s going!